The plumeria is a tropical flowering tree that thrives in areas that remain warm year-round. Growing to 30 feet in height, the best way to get your plumeria to bloom is by applying fertilizer. Plumeria is also called frangipani. 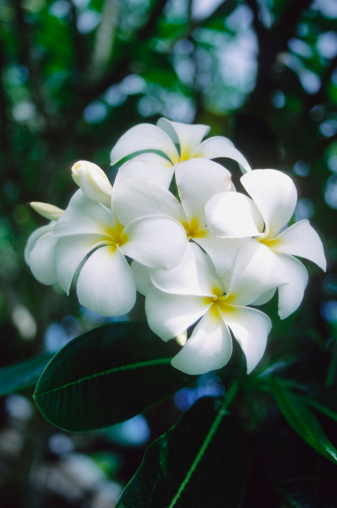 The best fertilizer for plumeria trees is one that is high in phosphorous, such as 10-30-10. A granular formula is preferable to liquid. Fertilize the plumeria every three months beginning in April and ending in August if you live in an area with frosts. Otherwise, continue to fertilize year-round. Use 1 lb. of fertilizer for every inch of trunk diameter. Sprinkle the fertilizer at the drip line and 2 feet beyond. What Is the Growth Rate of a Colorado Blue Spruce? When Is a Good Time to Transplant a Fruit Tree? In What Months Does the Plumeria Flower in Hawaii?